Whether you’re new to the liquid waste industry or you’re already running an established business, we can develop an equipment financing plan. Our flexible credit approval process makes getting that new (or used) hydrovac or septic pumper truck you’ve been eyeing easy. You know your business and we know ours, together we’d make a pretty great team. With Beacon Funding you get waste management industry expertise and hassle-free financing. Get pre-approved for a septic truck loan in as little as 24 hours. What more could you want out of a financing partner? Our Lease-to-Own Program, similar to a capital lease, is ideal for businesses that prefer long-term ownership of their equipment. Once you’ve paid off your lease, you’ll own your pumper truck. It’s that simple. The Sale-Leaseback Program allows you to unlock the equity in your business’ equipment and convert it to cash. Sell your septic equipment to Beacon Funding and let us lease it back to you over a period of time. You get the cash from the sale to use for a variety of business needs while retaining the use of your equipment, and then you reclaim ownership at the end of the lease term. Pinch yourself; you’re not dreaming. Our Pre-Approval Program allows you to apply for financing prior to picking actual pumper equipment. This lets you shop for trucks knowing exactly how much you can afford. Simply fill out our quick online application to get started. You’ll come away knowing your maximum lease amount and terms, a monthly payment estimate, whether any down payment is required, end-of-lease options, and more. It doesn’t get much easier than that. We’re so flexible that we don’t even bother with set age restrictions on used trucks. If you find some slick vacuum truck that’s been used previously, there’s still a darn-good chance we’ll finance it regardless of age. As long as the truck is in good condition and being sold at a fair price, Beacon Funding is here to fund it for you. A working capital loan loan gives you quick access to funds to keep cash flowing for your liquid waste removal business when you need it the most. No equipment leasing or financing agreement is necessary. Working capital may be used for a variety of needs, anything from equipment soft costs to warranties and payroll insufficiencies. Traditional lenders often disregard a young business. We think that’s crazy, because businesses under two years of operation need all the help they can get! 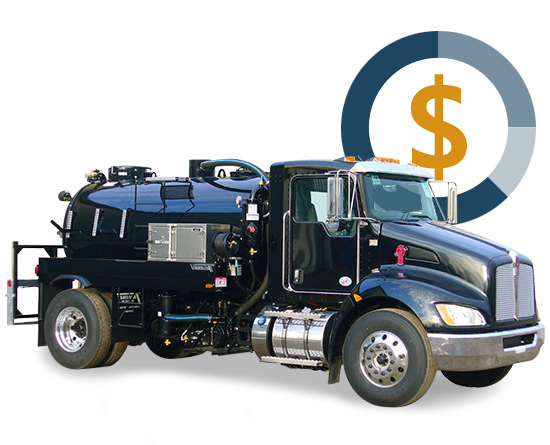 With our knowledge, we’re more than willing to provide financing to a start-up business looking to invest in the septic trucks we know and love. We can also help you grow if you are in the market for boom trucks, tow trucks, cranes, or even decorated apparel equipment. If you’re a new business owner, we’re your start-up leasing partner. No doubt about it. "We had excellent service. They were very friendly. I would certainly recommend anyone else to use this company. We couldn't be more satisfied! " "Beacon Funding was one of the easiest and most helpful processes we’ve been through when it came to financing. It was the best possible deal for what we needed. " "My consultant and his team are excellent. They do whatever it takes to make the customer happy. And they walk you through the process. They’re hands down the best around. " Our flexible septic truck financing programs are a starting point for building your custom loan. If one of our current programs doesn’t fit your needs, don’t worry. We’ll work with you to get a deal done that does.